Chailey Rehabilitation Centre is an NHS specialist facility that carries out almost unique work in the care and therapy of severely deformed children and young persons. The existing aluminium composite gutters had failed and the gutters were subsequently treated with a GRP coating which also failed. As a consequence, water had penetrated into the insulated core of the gutter from where it leaked into the highly specialised engineering workshop below where bespoke mobility aids are made to suit patients individual needs. Unifold was chosen to offer a permanent guaranteed solution. 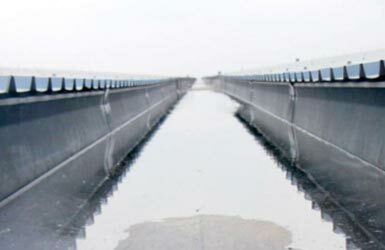 Due to negative falls, the gutters have historically held ponding water and were served by relatively small outlets positioned at the external end of each gutter run. The project involved dispensing with the existing outlets, cutting new chutes the full depth of the gutters through the existing stopends which discharges over new hoppers. The hopper outlets were then plumbed into the existing downpipes. 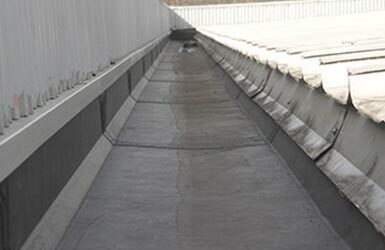 210 Metres of Unifold Gutters was installed at the DHL Supply Chain, Barming Depot in Aylesford. 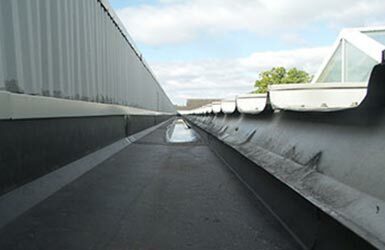 Installed by Blenheim Roofing, the project was a full strip & re-sheet of an asbestos cement roof. 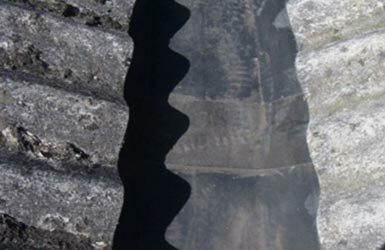 During initial surveys it was discovered that historically, the existing asbestos gutters were prone to leaks and overflow issues into the building. 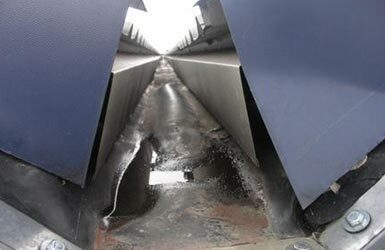 Unifold was not only used to line the gutters to cure the leaks but also increase the capacity. 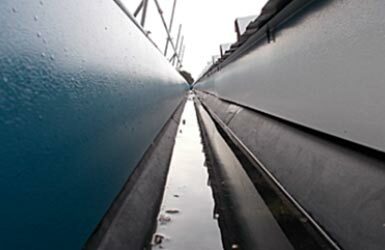 ARRIVA a multinational public transport company chose the Unifold gutter lining system as the preferred system for the refurbishment of their bus depots at Thornton Heath, Clapton and Croydon. All of the projects were completed by our approved contactors Blenheim Roofing based in Epsom, Surrey. 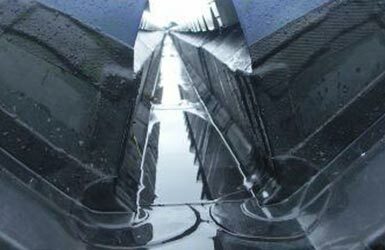 At the beginning of May, 2016, slightly more than 40 Metres of the UNIFOLD® gutter lining system was installed at the MOT Centre at the Wade Road Depot, in Basingstoke. In February 2016, 50M of the UNIFOLD® Gutter Lining system was installed for BEW Electrical Distributors in Orpington. BEW are a rapidly expanding chain of electrical wholesales currently with 19 branches nationwide, and only recently moved to their Orpington depot having previously traded from three much smaller units on the same business park. The new unit was plagued with numerous small leaks through an existing asbestos cement roof, the roof lights and steel gutters and BEW requested that Blenheim Roofing Services quote for lining the gutters, as well as for over-sheeting the roof. 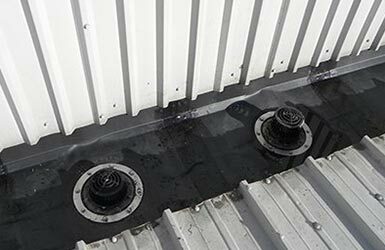 The installation of the UNIFOLD® Gutter Lining system was the second at a BEW depot, the first one completed five years ago, and the project was completed quickly and with no issues at all. 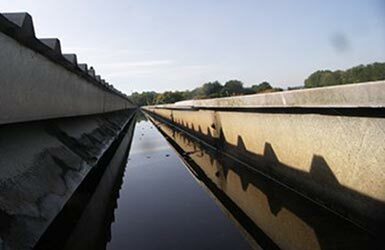 Over 500 Metres of the UNIFOLD® gutter lining system was installed during July and August of 2015 at Unit 1, Greenford Park, Ockham Drive, Greenford. 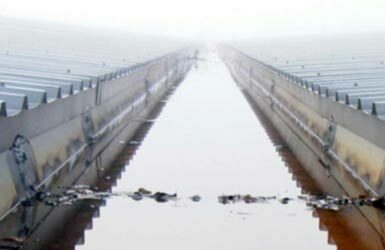 Used as a method of prevention, more than to solve any existing problems, the project contained a dozen siphonic outlet sections, which also contained overflows, along with corners, snorkel overflows, a fabricated stopend, tee section and 21 tapered outlets. The installation was carried out by J.A Philips Associates, Barking, who have carried out a large number of UNIFOLD® installations. Ampteam approved installer Blenheim Roofing Services were approached, in the second half of 2015, to quote for re-roofing units D1 & D2, Meridian Industrial Estate, Peacehaven and also to provide a guaranteed solution to the nearly 90 metres worth of guttering. The buildings were empty but were soon to be let and re-open as a trampoline Park. 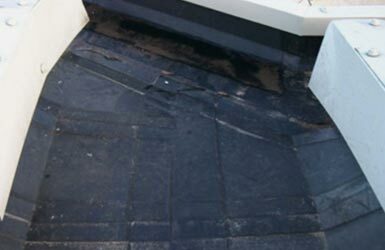 A smaller unit on the same estate had already been similarly re-roofed by Blenheim Roofing Services earlier last year and as UNIFOLD® is their preferred liner of choice, it was installed in the first unit and quoted for the above, with an order subsequently being received for the works. 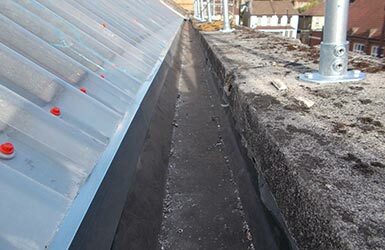 As the existing roof was of a double skin asbestos cement construction, the gutters were not able to be inspected properly until safety equipment, netting and scaffolding were in place. The gutters comprised of a central valley gutter between the two units which were a "stepped" layout so that the valley became an eaves gutter at each end where the buildings were staggered. Blenheim Roofing Services' subsequent inspection of these gutters revealed that the transition from valley to eaves was not an easy one and it called for Ampteam to measure very carefully indeed. Even though high winds were a problem throughout most of the contract, the installation went well and the project was completed within the designated contract period. 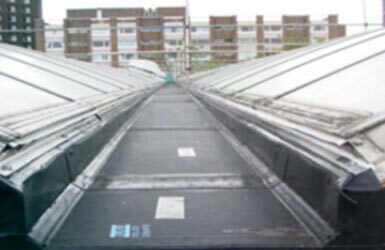 In Early August, as part of a project that also consisted of the resealing of capping joints and the repairs to the splits in the roof sheets, Ampteam were asked to provide the Unifold gutter lining system for at Mulberry School for Girls in the Shadwell ward of the East End of London. 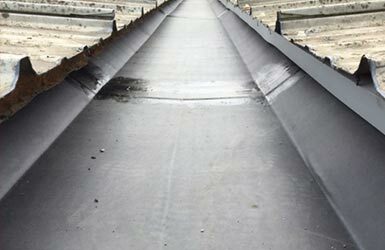 More than 170 metres of the UNIFOLD® Gutter Lining system was installed, over two runs of gutter, to solve the problem of joints leaks throughout the gutter runs. 10 outlets were installed within each of the runs of gutter and Expansion joints were also included within the installation, due to thermal movement problems within the existing gutter conditions. The UNIFOLD® gutter lining system was installed by Riteshield Roofing, Hitchin (01462 417233) who installed the system to a high standard. 2 runs of UNIFOLD®, totalling 117 metres, was installed during October 2015 at the Alligator Self Storage facility in Winchester. 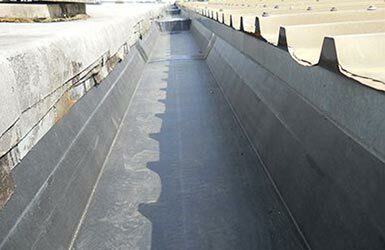 Each run consisted of two stopends, slot weir overflows, and sole outlets with a new weir overflow also being installed centrally with each run. Ampteam have since received a message from the installing contractor voicing their pleasure with not only the system but also the surveying aspect that Ampteam offer, saying that the system was "spot on, fitted like a glove". 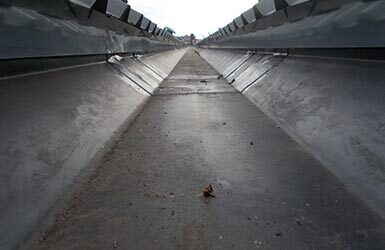 One run of the UNIFOLD® gutter lining system, totalling slightly more than 100 metres was installed early in 2015 at the Arnold Clark Training Centre on Bearing Drive in Wolverhampton. After more than three years on site and numerous attempts at coatings, mainly at localised joint failures, the UNIFOLD® system was chosen to solve the problems that kept occurring. The gutter contains 14 siphonic outlets, which the UNIFOLD® system easily accommodates, two of which were manufactured within the same section of gutter due to their close proximity to each other. This project was installed by Centurion Roofing Services, Tamworth. Over 60 metres of UNIFOLD® was installed during the spring of 2015 at Callaway Golf in Chessington. This particular project contained various items of unique fabrication comprising factory fabricated step sections and factory fabricated step up stopends, both of which were manufactured in two parts. 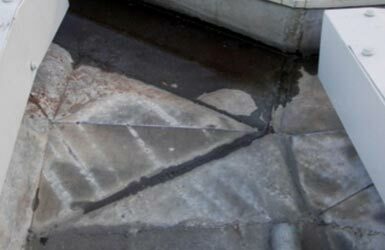 There were two of the step up stopends and five of the step sections within the gutter profile, along with 8 outlets, six of which were coned. This installation was completed by Blenheim Roofing of Epsom, Surrey. During the last few months of 2014 around 450M of the UNIFOLD® Gutter Lining system, including Corners, snorkel overflows and outlets, was installed for Cambridge Assessment at Progress House, Coventry. The existing gutter not only had leaks but, following calculations, did not have a capacity sufficient enough for the 'perfect storm'. The installation of UNIFOLD® enabled the legs of the gutters to be raised, making the gutter deeper, and increasing capacity, without any additional support required to the system. The UNIFOLD® gutter lining system was installed by MITIE Tilley Roofing, Stevenage (01438 355563), who have since informed us of the clients satisfaction and delight of the outcome. 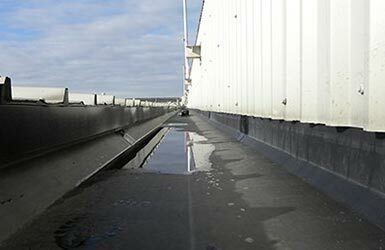 JCC Lighting in Bognor Regis suffered recurring gutter joint leaks within the last 20 metre run of the central valley of the roof. Repairs had previously been carried out to the joints along with routine gutter cleaning, however seagulls would peck at any coatings or tapes used for repairs and as a consequence, the leaks would return after a while. 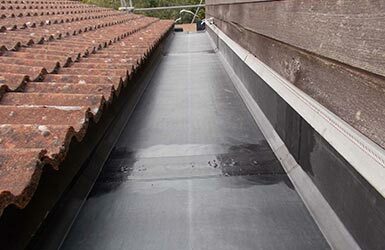 It was therefore decided to install approximately 20 metres of UNIFOLD® gutter lining, stopping just short of a sump outlet in the gutter to ensure it remained free flowing. The above photographs show a UNIFOLD® installation to Stratford Tools. 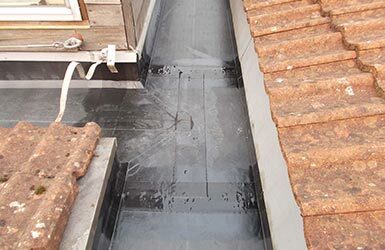 The building had been plagued by persistent leaks and although several alternative treatments to the gutters had been considered, UNIFOLD® was chosen due to its guarantee and projected longevity. 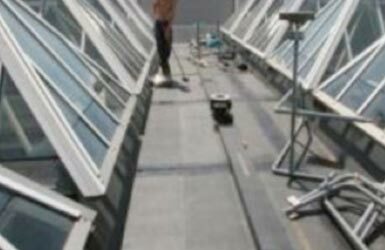 More than 350 metres of UNIFOLD® was installed including corners and tees as the roof was of hipped construction. 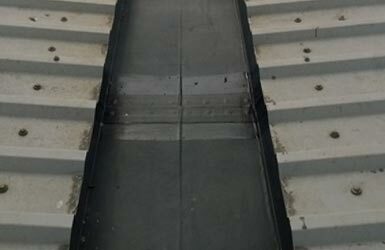 Corus, formally British Steel Corporation, have received the UNIFOLD® treatment many times. Since the first installation some 14 years ago, Corus buildings countrywide have had UNIFOLD® installed, many of which have been over 500 metres. The above photographs show the before and after treatment of the Corus distribution depot at Grantham where more than 550 metres was installed. More than 150 metres of UNIFOLD® was installed at HM Land Registry, Coventry. This installation utilised the UNIFOLD® patented clip-joint system designed to allow joints to be competently and successfully completed behind obstructions and where access is particularly difficult. 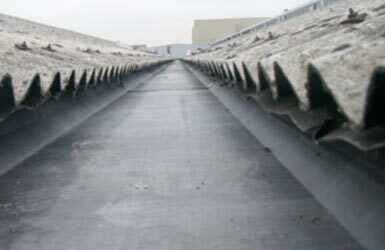 The existing gutter systems installed on the roof of the building were manufactured from GRP (Glass Reinforced Polyester).The GRP gutter joints had broken down due to thermal movement, for which this material is particularly prone. 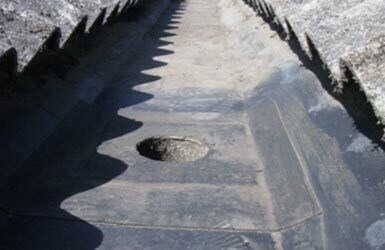 In order to ensure the integrity of the lining, system expansion joints were strategically introduced to induce Unifold to move in complete unison with the gutters beneath. The above photographs depict the UNIFOLD® installation to the Post Office distribution centre, Oxford. 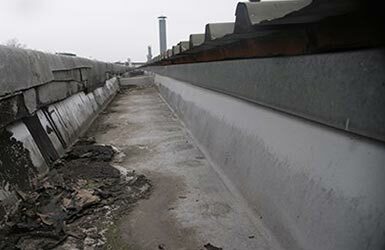 More than 700 metres was installed on two buildings both of which had corners and the larger of the two buildings also had tees and factory fabricated sloping cascade sections which discharged the valley gutter to the boundary wall gutters which were at a lower level. This installation has been one of 12 Post Office properties to receive the UNIFOLD® treatment over a period of two years. The Swansea distribution centre is another notable installation as this was part of a major roof refurbishment programme designed to conform to current Document L2 regulations. 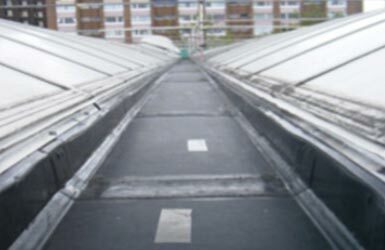 As part of a major roof refurbishment programme at Units 1-6, Electra Park, Electric Avenue, Birmingham, some 700 metres of UNIFOLD® Gutter Lining System has been installed to valley and parapet gutters serving the building. All six adjoining units are served by individual hipped roofs discharging to valley gutters and these are joined by tee sections into a parapet gutter installed around the entire periphery of the building. 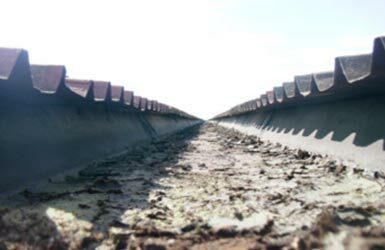 The valley gutters are some 80mm higher than the parapet gutters and to discharge to the lower gutter the tee sections are fitted with sloping ends. The Unifold installation has replicated the existing system with consummate ease, including all corners and tees. Ampteam Limited, were asked to provide a UNIFOLD® scheme for the conversion of level gutters, serving the central roof area of the building, to falls conditions, with a brief to eliminate standing water and leaks which had plagued the building for some time. 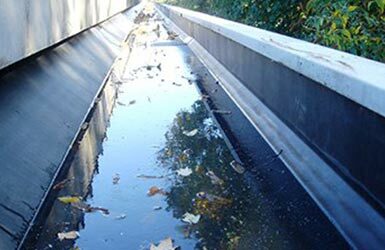 Some 900 metres of valley gutters serving four separate Atrium roof areas in banks of six, which in turn are served by 5 metre wide valley gutter sections serving as Access and escape link bridges, were requested to be converted from level to laid to falls. Lower valley gutter bounding the periphery of the roof area serve and discharge the main roof area via 5 metre wide chutes from the escape link bridges. 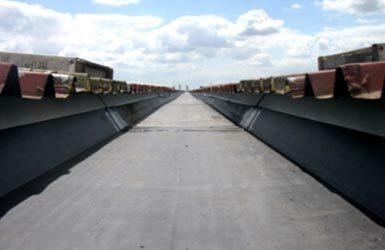 Positioned in the less sensitive areas, these were allowed to be laid level, although their existing holding capacity has been improved. 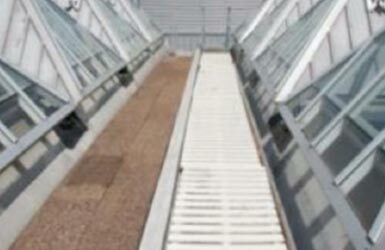 The existing roof and gutter areas had initially received a PVC membrane when built. This, however, was patched in many areas and showing signs of deterioration. There were many concerns about the continued longevity of this installation. 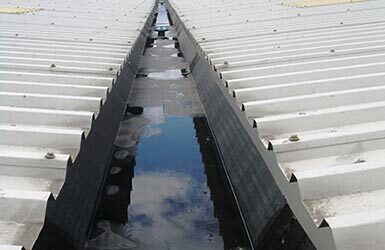 UNIFOLD® Gutter Lining System was chosen for its versatility, unfailing ability to replicate existing systems, provide falls conditions in level gutters and its long life. The system is also guaranteed for 20 years. Tapered Cork insulation was chosen to provide the base for the gutters and this was supplied in cut sets. The fall ratio was based on a minimum of 1:150. The Unifold gutters were purpose made to suit the falls ratio and provided in numbered sets to suit the individual gutters. Full site information was provided including schemes of falls, laying sequences and special details and instructions. In all, more than 50 separate drawings were issued to site. In accordance with Ampteam policy, all fabrication was factory manufactured and sealed prior to delivery to site. This ensures complete installation quality and integrity. 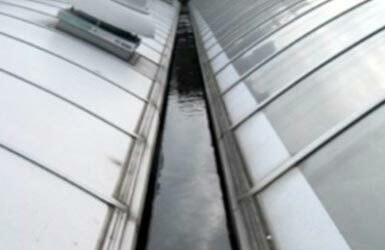 The valley gutters serving the central Glazed Atrium roof areas were installed first. These comprised an apex at the central position of the gutters with falls arranged down to discharge ends at the Escape Link Bridges. As the glazed Atrium roof was above a sensitive area, no weekday work was allowed. Friday deliveries were permitted but all work was conducted during weekends. The end Atrium Roof area valley gutters were single fall from a transverse gutter at the outer perimeter edge. 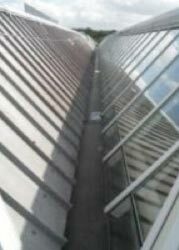 Access into the transverse gutter was extremely tight and normal joints could not be made so sections of UNIFOLD® were supplied to span individual Atrium ends and joins were made at the junctions with the valley gutters via factory manufactured tees, using UNIFOLD® patented clip joints. 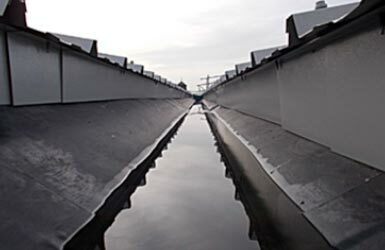 The existing transverse gutters were already higher than the valley gutters to aid discharge, but in order to create the necessary falls the UNIFOLD® transverse liner was lifted sufficiently to provide the required falls for the valley gutters. 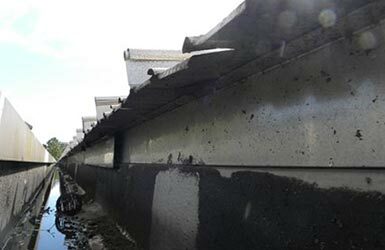 There was space to achieve this condition without compromising the capacity of the original transverse gutters. 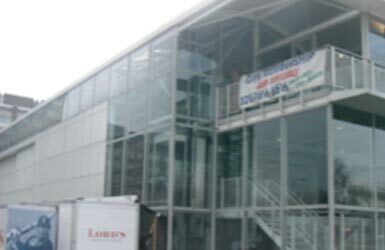 An installation to the Indoor Cricket Pavilion at Lords Cricket Ground was the result of some two years of design study and consideration to correct gutter deflections and broken gutter joints in the fully welded aluminium gutters. 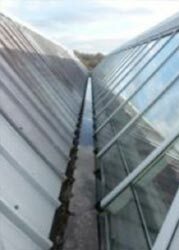 The broken gutter joints were the result of thermal expansion and contraction and were causing leaks into the building. The deflections in each of the four valley gutters and two outboard gutters resulted in standing water up to 60mm deep within the first 20 metres of the building. UNIFOLD® was chosen to correct the deflections using cut to falls insulation to provide positive falls of 1:200 in the problem areas. 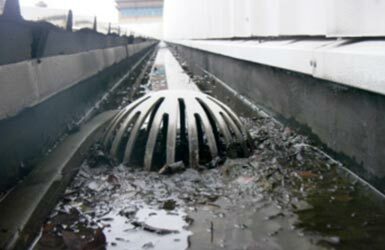 This resulted in the need for a new front UNIFOLD® gutter which was installed within the canopy at the front of the building and this was discharged to new drains via siphonic outlets and pipework systems. 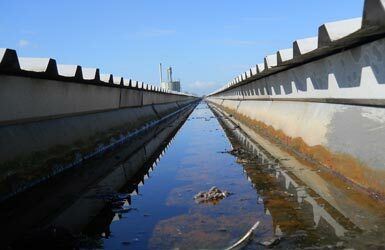 The work has been achieved with acceptable aesthetic conformity and has been fully water tested. Before the unfortunate demise of MG Rover, there were several installations of UNIFOLD® above sensitive production areas. The photographs to the left show before and after treatments. Ampteam were given the opportunity to inspect more than 1000 metres of UNIFOLD® which had been installed more than 15 years ago. 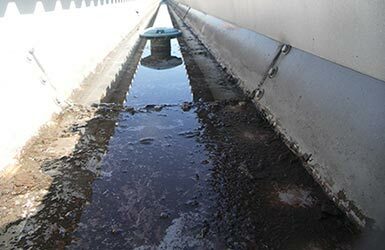 The gutters at Federal Mogul, Slough were being cleaned and certain areas were given special attention to ensure that the surface of the gutters could be inspected. 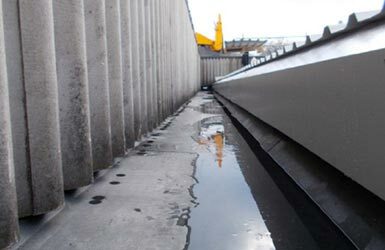 There was no deterioration to the surface of the gutters, or its component parts and this gives every indication that the projected lifespan of UNIFOLD®, above 35 years, can be confidently expected. 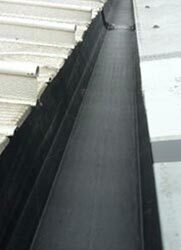 Following installation, UNIFOLD® cured all the existing gutter leaks and the building has since remained water-tight. Once sealed, the system will not develop a leak due to the double-sealed joint technology and the cold vulcanisation of the joints. The UNIFOLD® Gutter Lining System has recently been installed within five valley gutters, totalling more than 700metres, on the Argos Distribution Centre, Castlegate, Wolverhampton. 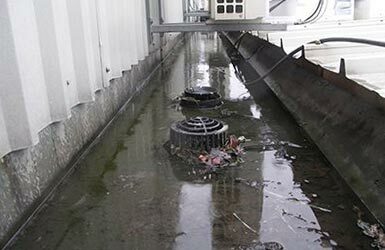 The facility, operated on behalf of Argos by Wincanton, had experienced severe storm water ingress due to the overwhelming of the existing gutters and outlets, causing severe damage and disruption. The roof had been over-sheeted several years ago and the existing gutters were fitted with a continuous plastics liner at this time. 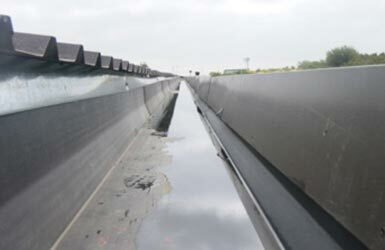 This liner was not lying flat due to expansion and contraction problems, leaving raised areas within the gutter, further reducing the available capacity and contributing to the problems being experienced. Ampteam Limited along with rainwater drainage experts CRM Rainwater Drainage were invited to propose a solution to the problem. 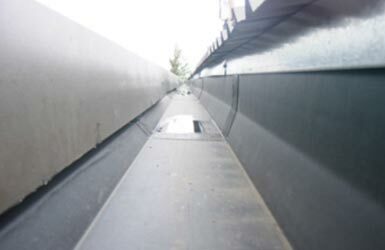 Following a survey by Ampteam and CRM, a design solution was provided for the gutters. As the existing gutter had insufficient capacity and any modification to the roof at the eaves position to enlarge the gutter was not an option, the design solution required the use of all of the available space within the eaves cavity. 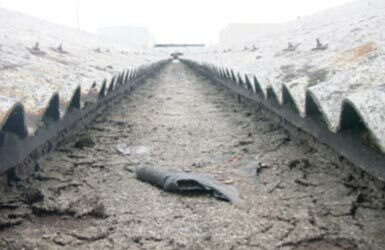 The situation was complicated by the need to control works on the asbestos cement gutters on a building constantly in use. This in turn meant that no extra outlets could be introduced and the existing outlets could not be enlarged. 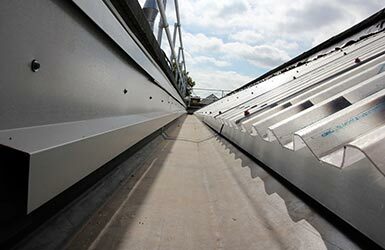 The solution involved the installation of a multi-hinged Unifold gutter, fitted and sealed to the underside of the roof sheet in order to maximise the gutter capacity, combined with specially designed siphonic outlets. As the eaves conditions varied along the gutter runs and within each gutter and access was tight, the UNIFOLD® was supplied with 7no hinges. This facilitated relatively easy installation in very difficult circumstances. 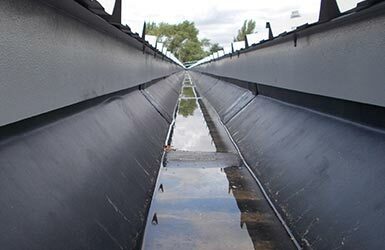 The UNIFOLD® gutter was also provided with factory fabricated side boxes to house the unique siphonic outlets that were designed and tested by Dr Malcolm Wearing of CRM Rainwater Drainage. 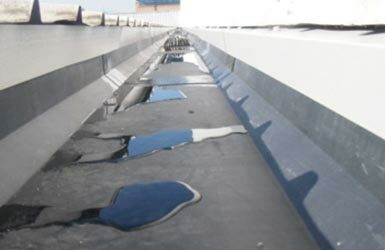 Although the capacity of the gutters had been increased to the maximum given the existing roof conditions, these siphonic outlets, manufactured and installed by Aquaphonixs Limited, were essential to improve the drainage performance of the existing outlets and to allow the system to function without any additional outlets. Fan shaped, semi-circular siphonic outlets with an offset 100mm diameter tailpipe were specially designed to fit inside the UNIFOLD® side boxes and into the existing 150mm diameter outlets. The siphonic outlet tailpipes were connected to flexible tubes, sleeved into the existing plastic downpipes. The custom made outlets were optimised and tested in laboratory conditions and proved to provide a capacity of over 27litres/second, ten times the capacity of a standard 100mm diameter outlet. Calculations to prove the design solutions of both Unifold gutters and siphonic outlets were provided by CRM Rainwater Drainage. 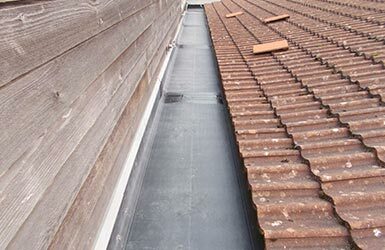 The UNIFOLD® gutter system was installed by approved contractors Traditional Structures Limited who, due to the relative complexity of the contract, originally forecast a period of 7 weeks to complete the installation. First class organisation, excellent site personnel and attention to detail by both Traditional Structures and Ampteam Limited meant that the installation was completed in just over 4 weeks with no disruption to processes within the building.